New from the Hope Springs Eternal department, we have a guy from Georgia who wants to build an cultural information welcome center for aliens. The purpose of Extraterrestrial Cultural Centers International (ECCI) is to facilitate the integration of earth humanity into the greater extraterrestrial domain of universal stellar civilizations. Our mission is to create an organization and facilities to accomplish this purpose. We intend to fulfill that mission through the creation of a network of extraterrestrial cultural centers and facilities around the globe. The emphasis will be on peaceful, mutually beneficial interrelationships sharing knowledge, understanding and love amongst all. With the publication of the Center Webpage, The First Conceptualization Phase of the Extraterrestrial Cultural Center is now almost complete and we begin to move forward on to the Second Phase; that of actualizing the Concept. Most of us doing the conceptual work have little experience with organization and management. We hope, now that the Conceptual Phase is ending, that a much more experienced and capable management team will join with us, to bring this Concept to reality in Phase Two. Phase Two will require high caliber business people coming on board who are capable of running a large organization and who also have the fundraising capabilities necessary to raise millions of dollars to build the Centers. The initial task for the advanced management team is to make the Extraterrestrial Cultural Centers International a legal non-profit entity and to begin fundraising for a modest operating budget the first year. So "Phase Two" seems like it has some inherent stumbling blocks, namely: (1) millions of dollars to build the Center; (2) millions more dollars to run and staff it; and (3) smart business people to run the whole thing. I'm not sure that (3) isn't the biggest problem, honestly. As we've seen many times, there is no short supply of people willing to donate large amounts of money to oddball causes, but getting your average MBA to turn down a lucrative job in Los Angeles to run a UFO welcome center seems like a losing proposition. Reminder * Lightship System White Ibis: What are disclosure and ET contact about? To really understand you have to go beyond the phenomenon of space and time. Higher your frequency, and meet us half way! Jesus led the resistence [sic] to Enlil - Yahweh, the genocidal Commander of the goldmining expedition from the planet Nibiru to Earth. Jesus, from his home in France and in North America, defied Yahweh and taught 'Help the poor. Sustain the feeble. Do evil to no one. Do not covet what you do not possess. Reverence Woman, the foundation of all that is good and beautiful.'". So. Yeah. However well-meaning Komarek is, some of his followers seem to be a few fries short of a Happy Meal. Or maybe that's just my narrow understanding because I haven't "highered my frequency" yet. Anyhow, I'm not sure how I feel about all of this. I mean, Komarek's certainly to be encouraged to do whatever floats his boat, and the whole thing seems harmless enough. As hobbies go, spending your time drawing up plans for building roadside stops for aliens isn't really any crazier than having a fantasy football team. It's just that the whole thing seems a little premature. I mean, we don't even have incontrovertible evidence that extraterrestrial life exists, much less that they've ever come here; so having a massive complex designed to make them feel welcome seems kind of like an exercise in futility. There is, of course, the possibility that it could become a tourist attraction for plain old humans, similar to the International UFO Museum and Research Center in Roswell, New Mexico. If Komarek succeeds in his alien version of "If you build it, they will come," I know I, for one, would plan a visit there. Of course, he still has his millions of dollars to raise, and his MBAs to find, and when I checked, his Facebook page only had 592 followers, including the three people quoted above, who hardly count. So I'm not sure how likely it is to be realized, at least in my lifetime. It's sad, honestly, because other humorously ironic projects have actually succeeded. I mean, they succeeded in building the George W. Bush Presidential Library, after all. When the aliens come, I don't think they'll want to spend all their time in cultural centers. They'll want to get out and meet people. 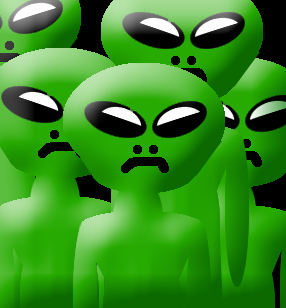 I'm trying to convince the local city council to establish an Extraterrestrial Liaison volunteer position, which I would gladly fill. There wouldn't be much to do, and I'd get to attend the volunteer dinners, and we'd be ready, just in case the ETs came to our town, with someone who's up to date with current thought and speculation about what aliens might be like. Some of you out there could do the same. I heard that they'll only give you their advanced technology if you take them to a romantic comedy and lobster dinner. Order a nice wine and find lots of excuses to toast... by the end of the night they'll be crying on your shoulder and giving you all the juicy details about antigravity and wormhole travel.